Following on from the DSS-equipped Infiniti 36 fast daysailer, the first Infiniti 46R has just completed sea trials in the south of France. 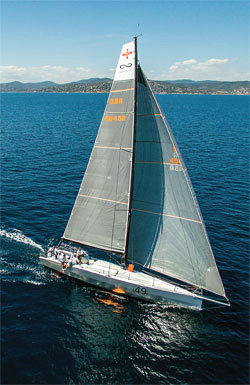 The Infiniti 46R has been developed as an offshore/coastal race yacht for the classic 600-miler races such as the Sydney Hobart, Fastnet Race, Middle Sea Race and the Newport-Bermuda. Hull no1, Maverick, will debut shortly at the 2016 Giraglia. Designed by DSS creator Hugh Welbourn and engineered by Gurit, it is also built using Gurit carbon pre-preg with an M-Foam core. Read on.